acon Industrial USB 3.0 Drive Metal is a super speed USB 3.0 removable flash disk drive with USB 3.0 connection (backward compatible with USB 2.0and USB 1.1) and supports various storage capacities. The acon Industrial USB Drive is a plug and play device, simply plug it into any USB port and it will automatically get detected by the computer. acon Industrial USB 3.0 Drive Metal is a super speed USB 3.0 removable flash disk drive with USB 3.0 connection (backward compatible with USB 2.0and USB 1.1) and supports various storage capacities. With the high capacity of the Industrial USB Drive, you can use it as an external removable hard drive. 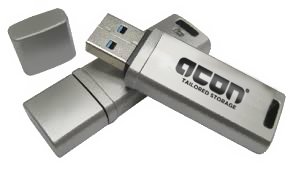 acon Seal USB 3.0 Drive Metal is resistant to practically any environmental danger. The metal case encloses and protects the core, and a special sealing compound hermetically seals the sensitive electronic components within and protects your data reliably against liquids, dust, dirt, shock and vibration. acon Seal USB Drive is a super speed USB 3.0 removable flash disk drive with USB 3.0 connection (backward compatible with USB 2.0and USB 1.1) and supports various storage capacities.